Below are the only cages from Petsmart that are appropriate for rats. On this page, I will be doing my best to include every pet and rat cage there is to purchase, and whether or not I feel as though it is acceptable for rats and up to standards. I am aware that some breeders have different cage requirements for their rats and that opinions may differ from breeder to breeder, but these are my opinions on the cages and whether or not rats would be happy and healthy living in them. Pan in the bottom can be chewed out of. Not really chew proof. Food that comes with cage is inappropriate for rats and should be thrown out. Below are all the cages from Petsmart that are inappropriate for rats. Please note that some of these cages may still make decent carriers for ratties when you are moving them from place to place, or cleaning your main cage. None of the wheels in these cages are appropriate for rats and can be dangerous for them. If you are to use one of these as a carrier, please remove the wheel first. All Living Things Rabbit Starter Kit - Not appropriate size wise for rats. Food that comes with this is inappropriate for rats. Fine as a carrier. Super Pet Critter Trail Dazzle - Not appropriate size wise for rats. Cannot be used as a carrier. Kaytee CritterTrail One - Not appropriate size wise for rats. Fine as a carrier if wheel is removed. Kaytee CritterTrail Easy Start Small Pet Habitat - Not appropriate size wise for rats. Fine as a carrier if wheel is removed. 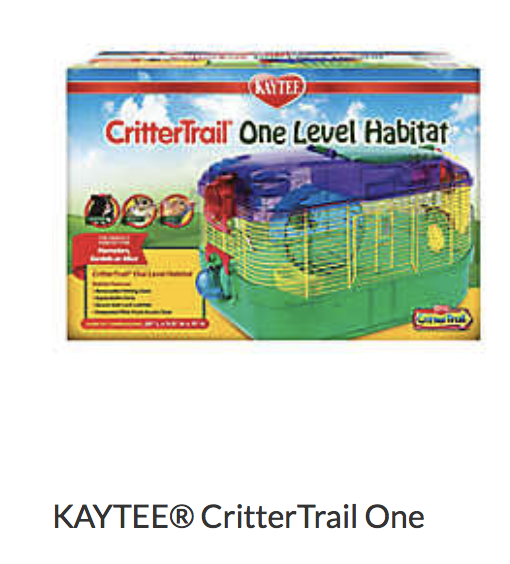 Kaytee Critter Trail Loop-N-Play Small Pet Habitat - Not appropriate size wise for rats. Cannot be used as a carrier. National Geographic Connectable Guinea Pig Small Animal Habitat - Not appropriate size wise for rats. Fine as a carrier, but not for baby rats. Bar spacing is too large. Kaytee Easy Clean Small Animal Habitat - Not appropriate size wise for rats. Fine as a carrier if wheel is removed. All Living Things Easy Access Guinea Pig Habitat - Not appropriate size wise for rats. Fine as a carrier, bar spacing may be too big for babies. All Living Things Dual Level Ramp Habitat Small Pet - it is ok size wise, not the best, but would be hard to fit good entertainment in here and cleaning would be difficult. 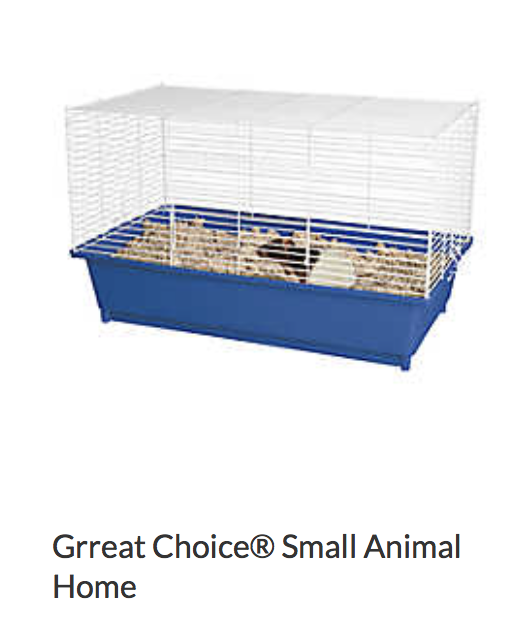 Great Choice Small Animal Home - Not appropriate size wise for rats. Fine as a carrier. Not appropriate size wise for rats. Kaytee CritterTrail Two Level Habitat - Not appropriate size wise for rats. Fine as a carrier if wheel is removed. Super Pet Critter Trail x Small Animal Home - Not appropriate size wise for rats. Not appropriate as a carrier. National Geographic Connectable Rabbit Small Animal Habitat - Not appropriate size wise for rats. Fine as a carrier, bar spacing may be too big for babies. All Living Things Luxury Rabbit Cage - Not appropriate size wise for rats. Fine as a carrier, bar spacing may be too big for babies. Kaytee Critter Trail Lighted Small Pet Habitat - Not appropriate size wise for rats. Not appropriate as a carrier. Habitrail Retreat Hamster Cage - Not appropriate size wise for rats. Appropriate as a carrier. Living World Deluxe Small Animal Habitat - Not appropriate size wise for rats. Fine as a carrier, bar spacing may be too big for babies. Grreat Choice Rabbit Starter Kit - Not appropriate size wise for rats. Appropriate as a carrier. All Living Things Guinea Pig Starter Kit - Not appropriate size wise for rats. Appropriate as a carrier. All Living Things Hamster Starter Kit - Not appropriate size wise for rats. Appropriate as a carrier.